Today’s Brew: Pumpkin Spice. Julie’s out drinking with The Esquire. They left me home. Alone. So I’m blogging. In little more than a month, Because The Night will be available everywhere. It’s exciting, terrifying, and hardly seems real. When I looked back to Julie’s first post like this to see what she did, I noticed she said the same exact thing. It’s surreal. Today someone on Goodreads added my book to her “top TBR” list. I don’t know this person, and she’s got my book on a list with JR Ward. Anyway, I want to take this opportunity to introduce you to the major players in Because The Night. I’m going to kick it off with Ms. Lennon Rose. First of all, I love this name. I had to use it. The character had to be worthy of her name. Cool as hell. When I originally envisioned her, she was going to be a photographer. I had crafted her a little bit in the likeness of my friend Kiva, who is also a rock n’ roll photographer. Kiva is super zen, and one of those people who all the musicians just know is cool. Kiva has this button on her camera bag. Lennon is Callie’s coworker. She is Callie’s mentor in this strange new underworld she’s discovered in Las Vegas, and the two become best friends even though they haven’t known each other long. Like Kiva, she’s very calm and zen. She was a part of the vampire rock scene before there was a scene. She moved to Las Vegas from Nashville with her then boyfriend Simon, who became the bassist of Immortal Dilemma. Because Lennon already worked at Embrace, the vampire-only bar, they knew it wasn’t so awful to be a vampire. But still, the reality of having a vampire lover was more than she could handle. But once she walked away, she craved the Bloodlust. Normal life wasn’t enough for her anymore. Now Lennon is with Jacey, the guitar player in Fire Dancer, Immortal Dilemma’s in town rivals. If Callie thought she was in over her head dealing with Immortal Dilemma, Fire Dancer adds a whole new layer for her. In Nashville, Lennon worked as an exotic dancer. She tried to do the same in Vegas but the expectations were different. More was, you know, expected. She found bartending at Embrace to be a better fit. In an earlier draft, Lennon hinted at a hard childhood. We might have to explore than more someday. I feel like there’s a lot more to this girl than meets the eye. Lennon loves all things vintage. 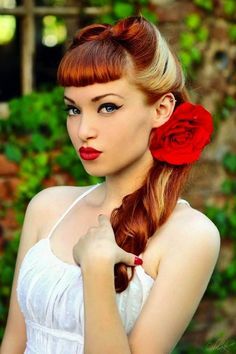 She has a rockabilly pinup style, mid century decor in her apartment, and loves I Love Lucy. She loves doing makeup and watching soap operas. No one gets Callie like Lennon does. There aren’t many girls in Vegas who can capture the attention of a vampire rocker long enough to have an actual relationship with one. Those girls need to stick together. Even when Callie splatters all over the pavement, Lennon is there for her. And that is how you define a friend. Which brings me to the GIVEAWAY. Want to win a copy of BECAUSE THE NIGHT? Go to our facebook page (it’s easier for people to comment there) and tell me about the nicest thing your best friend has ever done for you. I’ll choose a winner on October 8th. Only too glad to leave my comment on FB!